Though Dachshund in length and profile, this is a Hanukkah Dog Not Hot Dog dog. Saddled with a Menorah-to-go the theme is unmistakable. You might get more play-time mileage out of this plush toy if the Menorah was removable, but I did not test that aspect. 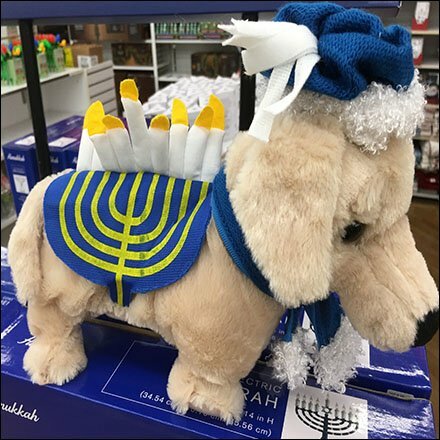 This Hanukkah Dog Not Hot Dog part of the Seasonal Displays at Bed Bath and Beyond.